North of the West-End, Camden is a bustling London borough oozing with an alternative culture and urban vibrancy that is unmatched by any other part of the metropolis. The unique area is home to an assortment of individual shops, market stalls and one-off places to eat as well as being well renowned for its diverse music scene attracting visitors from near and far. With its unconventional yet varied scene, Camden attracts people from all walks of life such as: Goths, punks, rockers and vintage lovers. 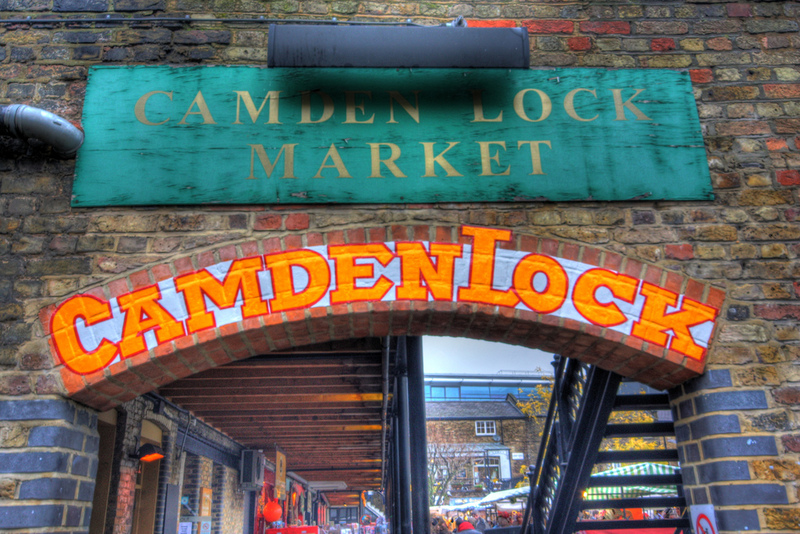 Camden Town is notorious for the prominent Camden Market which has now become a popular tourist attraction in itself. Each market stall has a character of its own and particularly appeals to the ‘alternative’ crowd for its one-off clothing, old antiques, crafts and many other unique items you wouldn’t find anywhere else. The Camden Lock proves popular during the summer as people can take relaxing canal-boat trips along the Regent’s Canal, making a pleasant change to the usual hustle and bustle of London’s public transport. The Camden Head is one of the oldest pubs in Camden and has been in operation for more than 100 years. It is also one of the many popular venues that make up the annual Camden Crawl festival as well as doubling up as a comedy venue where well-known comedians such as Alan Carr, Stephen Merchant and Bob Mortimer have performed. Street vendor food is a unique twist to traditional eateries and is a common sight in Camden. It gives people the chance to try food from all around the world - with stalls selling Japanese, Indian and Chinese – as well as picking up a right bargain. Listen out for the ‘Bang Bang Chicken Man’ who has become a bit of a cult figure around Camden with his £3 mix-and-match container of Chinese food. There is nothing short of an eclectic mix of live music when in Camden Town, this reason alone is why most people find themselves so attracted to the distinctive area. The Electric Ballroom is a trendy live music venue that has hosted the likes of The Red Hot Chilli Peppers, U2 and Public Enemy. Then there’s the Roundhouse Theatre, an iconic Camden venue that hosts more than 60 artists over 30 consecutive nights as part of the annual iTunes festival. But it is not only during this month of mayhem that the venue draws in the crowds – in the past big names such as Jimi Hendrix, Pink Floyd and Coldplay have performed here too. Jazz singer Amy Winehouse is a proverbial name in the area especially after her untimely death last year in her Camden home. Many of her adoring fans still flock to her local pub The Hawley Arms to pay homage to the Back To Black singer. It is a venue she frequently played off-the-cuff shows and even climbed behind the bar to serve other customers. Proud Nightclub is a popular hotspot for people who enjoy seeing live bands play, to hire out karaoke rooms or chill in the outside bar. Either way this nightclub offers a wide range of music to suit all kinds of tastes from the likes of Rihanna to Johnny Cash. KOKO (and Camden in general) not only boasts musical history but this venue was once graced by a young Charlie Chaplin during the time it was Camden hippodrome. Ever since, the place has seen a number of restorations but it has always maintained it star-status with performances by the like of Prince and Madonna. It is little wonder that it has been named as one of the best places to experience a live gig in the whole of London. All in all, there’s no denying Camden is one of the most thriving areas of London city that always deserves a visit if in the mood for live music, inexpensive food and a diverse atmosphere like no other.